On this affordable Italian tour package, the town of Montecatini serves as your home base from which to venture out daily to explore the surrounding landscapes of breathtaking Tuscany. You’ll indulge in picturesque scenery, world-class local wines, traditional cuisine, and cultural discoveries via eight days of regional excursions. 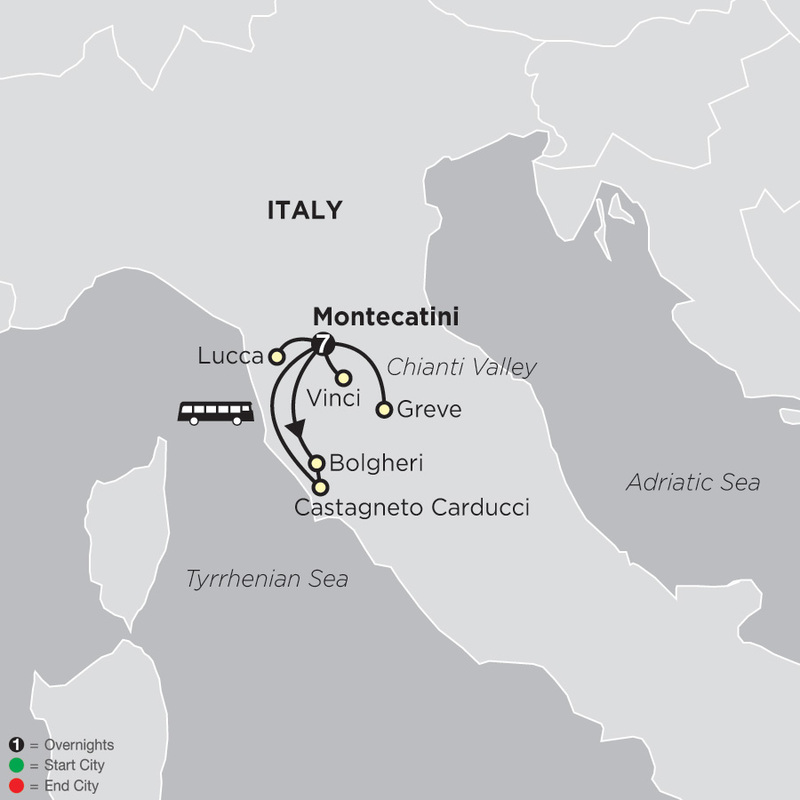 You’ll revel in the beauty of becoming familiar with a single destination of Montecatini while making priceless daily discoveries of locales that are off the beaten path – perfect for the smart, creative, and budget-minded traveler. ARRIVE IN MONTECATINI, ITALY. Check into your hotel. Tonight, meet your Tour Director and fellow travelers and enjoy a special welcome dinner. MONTECATINI. Enjoy a leisurely morning in Montecatini, maybe go for a walk in the Parco delle Terme with its huge shady trees. Most of the afternoon will be dedicated to the Italian cooking lesson at a rustic farmhouse in the Tuscan countryside. Once you arrive at the farm, enjoy a welcome drink, explore the orchard to pick some fresh ingredients, learn about Italy’s most famous delicacies, and then roll up your sleeves for a fun, hands-on COOKING EXPERIENCE. This evening, relax with your traveling companions and savor the delectable dinner you prepared—maybe your team will win the master chef prize! MONTECATINI. This morning is yours to do as you please. You could choose to explore more of the city on your own, to relax and shop for souvenirs, or to join an exciting optional excursion. This afternoon is dedicated to a COOKING CLASS at your hotel, focusing on the creation of cakes and desserts. MONTECATINI. Your vacation ends with breakfast this morning.